The last days of the year are a time for most of us to take a deep breath and sink deeply into the couch after the holiday craziness. It’s also a great time to do some introspective art. Rather than endlessly scrolling through social media or watching Harry Potter for the tenth time, (who, me?) why not make some time for yourself and your art practice by using these intuitive painting techniques? I had a ton of fun developing these pages and I can’t wait to see what you create. I’ve included a list of tips and supplies below, but first here’s your tutorial! Intuitive painting is an invitation to be non-judgmentally present with yourself. See what shows up on the page and follow it. Don’t be perfect, be open. Stand back and let the painting “speak” to you: Pick up your journal and stand it up. Take several steps back and consider it from a distance. Trust your imagination. When you think – “Oh, this reminds me of,” or, “It’s sort of like” let that shape the direction of the art piece. Work on more than one painting at a time. This will help keep you from overdoing or forcing your art pieces in a particular direction. Turn your work and create from different angles. Break some art rules. Write on your painting or use art supplies the “wrong” way. Mix and match different elements of your art practice: Sew on journal pages, stamp on painted pages, or dance while you paint. It will make your work more fresh and more you. Take your time. Give yourself and your work the respect it deserves and let the intuitive painting narratives unravel slowly. It might be a narrative about a character, or simply about color. Be open to whatever offers itself to you. Our art is after all, a gift. If you’d like to learn more about working this way, check out my class, Fluid Art. I’d love to hear about your intuitive painting experiences in the comments. *Most of the links are affiliate links. This means that at no extra cost to you, if you choose to click and purchase something, you’ll support the work of Mindful Art Studio at no extra cost to you. Thank you! Welcome to the Mindful Art Studio community! I'm Amy. I'm here to show you how to paint from your heart and soul and play with art again. 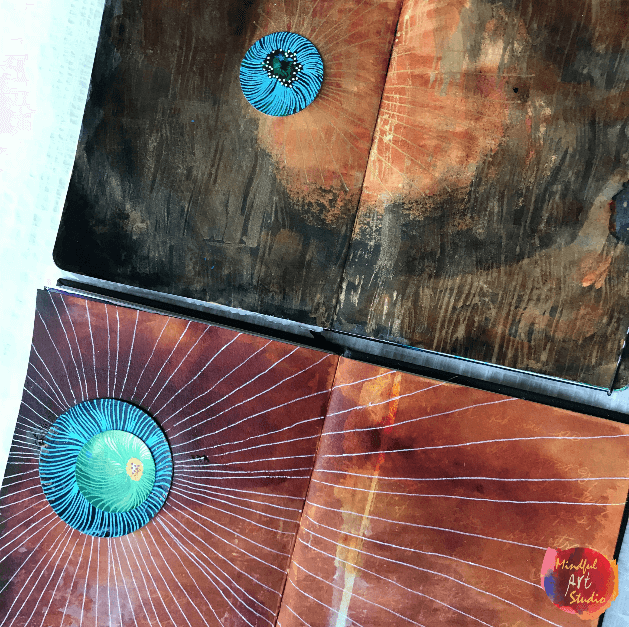 Free Art Journaling Class For You! Use this fun, 6-day art journaling and creativity course to make more art and feel better. It's FREE! You'll also be added to the email list and receive weekly emails about blog posts, workshops, and classes that will help you deepen your art practice! Not Art Therapy: This information is not a substitute for professional psychological advice, diagnosis, or treatment. All content provided by Amy Maricle is intended for general information purposes only. Never disregard professional medical or psychological advice or delay seeking treatment because of something you find here. The art information and tutorials found here may be relaxing or healing, as many art activities can be, but they are not art therapy. Affiliate Links: Mindful Art Studio accepts some paid advertising banners and contextual affiliate links. An affiliate link means that I receive commission on sales of the products that are linked to in my posts if you click on them from my site. I promote products, books, and services I really trust and believe in. Any affiliate links are clearly marked.